Regent Centre’s general manager goes on Maternity leave and appoints interim manager to look after the Centre. Staff, volunteers and trustees at the Regent in Christchurch are celebrating at the news that their general manager, Felicity Porter, gave birth on Friday 5 January to a healthy, bouncing baby boy whom she and her husband, Ben, are calling Otis. Felicity, who joined the Regent as deputy manager in September 2013, was promoted to General Manager in January 2017 and has taken the Centre on to new heights as the Regent became the winner of the Royal Opera and Royal Ballet’s Highest Admissions award for their live satellite broadcasts in 2015, 2016 and 2017. The Regent has also been the Best Performing Site for the Andre Rieu broadcasts in 2015 and 2016. 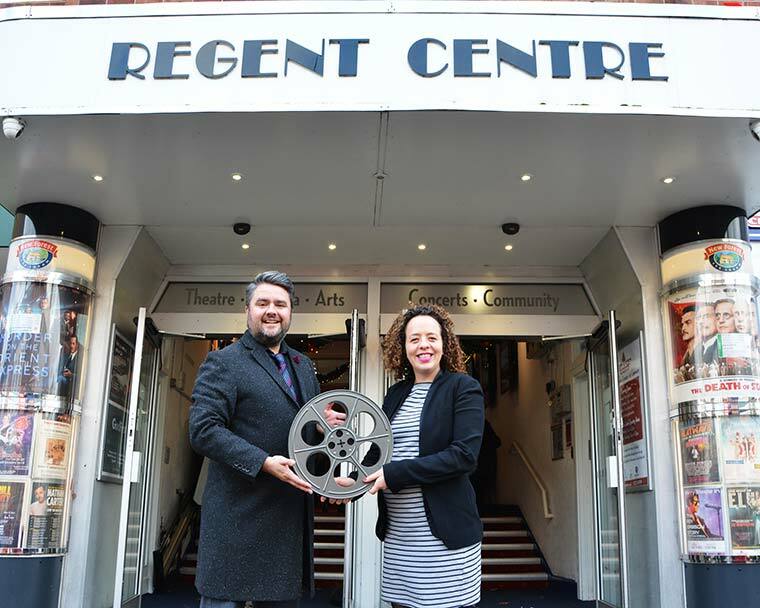 These accolades resulted in the Regent being a Finalist in the Event Cinema Association’s Best European Independent Event Cinema Awards for 2016 and a nominee for UK Theatre’s Most Welcoming Theatre for 2016. Felicity has handed over her other baby, the Regent, to the tender care of interim manager, Rupert Barrington. Rupert is the former theatre manager at the Jellicoe theatre, which is part of Bournemouth & Poole College. Felicity said, “We are so lucky to have got Rupert to cover my maternity leave. He has exactly the right background and experience to ensure the Regent is in safe hands whilst I am away.” Indeed, Rupert is part of a family dynasty of local dancers, singers and actors who have been involved in performance and theatre in the area for generations. His grandfather, Jim, was one of the leading lights who helped raise funds to build a theatrical venue in Ferndown and the Barrington was named in his honour. Rupert’s aunts are all involved with local companies with Helen having just written and directed the popular and successful, Christmas Spectacular at the Regent in December, whilst his other aunt, Tracey, is a longstanding member of both Regent Rep and Highcliffe Charity Players. Meanwhile, Rupert’s uncle, Paul and his wife, Emma, are also regular Charity Players performers. Rupert also runs the South Coast Academy of Performing Arts with his wife, Jo, herself the former head of performing arts at Bournemouth & Poole College. Together they co-produced, with West End star Earl Carpenter, the Ginger Boy Productions show of ‘SCROOGE’ at The Shelley Theatre. Rupert’s stepdaughters are also treading the boards with 18-year-old Iszy studying for a Musical Theatre Degree at the Jellicoe and 15-year-old Georgie working with her parents at the South Coast Academy. Meanwhile, his son, 7-year-old Mackenzie, took his first ever steps on the Jellicoe stage. Rupert will be working closely with Christchurch Borough Council during 2018 on the schedule of repairs to the south wall of the Regent. His experience in helping oversee the £11 million construction of the new Jellicoe theatre in 2015, will be invaluable during the Regent’s essential repairs taking place in 2019.